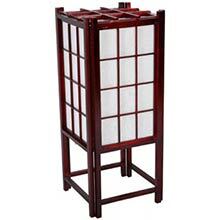 This beautiful handcrafted Japanese lamp captures the quintessential essence of Japanese decor with its rice paper design and wood framework. 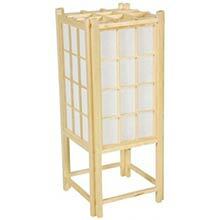 Elegant and compact, this Asian lamp makes for perfect decoration in any setting. This beautiful handcrafted Japanese lamp captures the quintessential essence of Japanese decor with its rice paper design and wood framework. Includes UL approved electrical components - socket and switch. 25 watt bulb is recommended. All Japanese Lamps ship with FedEx ground within the continental United States. For shipping to any other location, or for expedited shipping, please email us or call us for a rate. We can ship overnight or second-day, and to most other locations in the world.